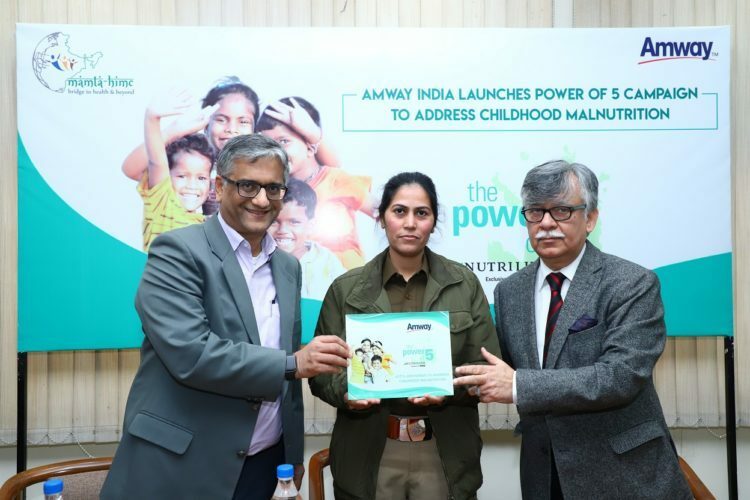 Amway India, the country’s largest FMCG direct selling company, launched the ‘POWER OF 5’ campaign to address the rising problem of malnutrition among children in India. In line with Amway’s vision of helping people live better lives, the Power of 5 is a community-based campaign targeted at mothers and caregivers of children under the age of 5 years. The campaign aims to improve the nutritional knowledge and practices inclusive of complementary feeding, hygiene practices, growth monitoring and dietary diversity. The campaign further aims to identify and manage the malnourished children, and those with infections, by developing synergies among the service providers of associated departments (Integrated Child Development Scheme, Health and Sanitation) for improved services and timely referrals. According to the World Health Organisation (WHO), roughly 7 million children under the age of 5 die each year from preventable causes across the globe. Malnutrition is the underlying cause of 45 per cent of these deaths according to the WHO. In India, malnutrition among children is a major concern too, belying nation’s increasing economic achievement. According to a recent report by the World Bank, approximately 8 million Indian children suffer from Severe Acute Malnutrition (very low weight to height ratio). According to the National Health Family Survey, 36 per cent children in India below the age of 5 years are under-weight. The report further states that 38 per cent are stunted, 21 per cent are wasted, 7.5 per cent are severely wasted, and 58 per cent are anemic. The campaign aims to mobilise communities to encourage participation and to empower individuals by raising awareness of the services and entitlements among beneficiaries. Additionally, ASHA workers, ANM and Anganwadi workers will be sensitised to drive the behavior change among the parents and communities to establish synergies for timely inclusive service deliveries to the identified target beneficiaries. With MAMTA Health Institute for Mother and Child as its implementing partner, Amway will reach out to and benefit around 10,000 children directly through mothers and 30,000 individuals indirectly (parents, caregivers and community members) in West Delhi’s Kirari area in the first pilot year.